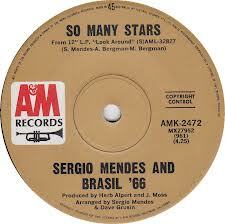 “So Many Stars” was originally written for Sergio Mendes and the Brasil 66 for their 1968 album Look Around. Since then, the song has found great popularity with popular, jazz and cabaret artists including Kathleen Battle, Lee Konitz, Sarah Vaughan, Earl Klugh, Cleo Laine and Susannah McCorkle. “So Many Stars” was recorded in January, 1986 and was released that year on The Art of Excellence. The album was orchestrated and conducted by Jorge Calandrelli.